Amazon's iron grip on the ebook reader market is not going to loosen anytime soon. Products such as the Kindle Oasis ensure that the company caters to the premium niche, while the Kindle Paperwhite serves most other customers just fine. Even then, few people can justify spending above Rs. 10,000 on an ebook reader. If you are one of them, you're probably looking at the Amazon Kindle. The base model in Amazon's ebook reader lineup is priced at Rs. 5,999, which is bound to appeal to many more people. To lower the price, there have to be some compromises. Has Amazon cut one corner too many or has it managed to strike a perfect balance between price and quality? We used the Amazon Kindle for a couple of weeks to find out. The Amazon Kindle is about the same size as the Paperwhite. It's no match for the light and small Oasis, but it doesn't cost Rs. 24,000 either so we will happily live with its size and weight. 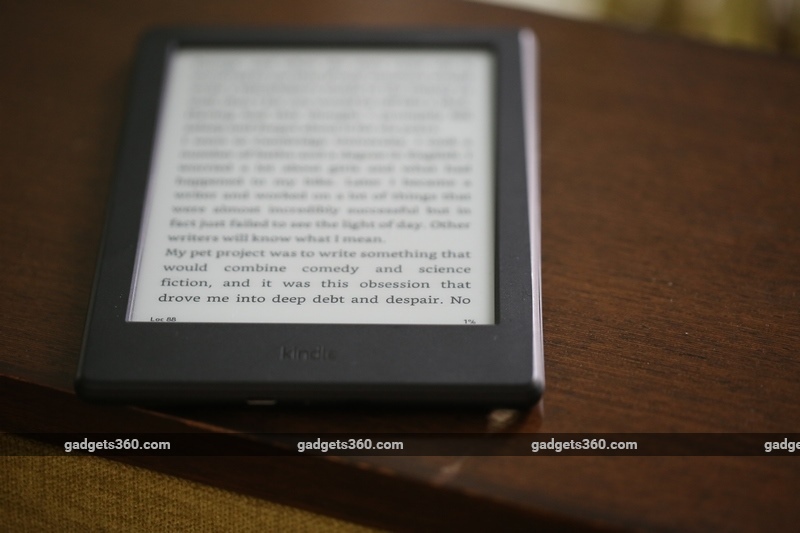 The new Amazon Kindle is thinner and lighter than its predecessor, so that is a big plus. The moment you hold it, you will notice one of the compromises. The body is plasticky and lacks a premium feel. The bigger problem is that the Kindle's back is made of a slippery plastic material. This made us grip it a lot tighter than we're used to with the Paperwhite, leading to some discomfort. Cynics might wonder whether this is a way to drive up sales of Amazon's covers for the Kindle, which cost a whopping Rs. 2,000 each. We kept it in a bag with another Kindle, a smartphone, and a notebook when we weren't using the ebook reader and we noticed two small scratches on its bezel. If cosmetic damage bothers you, a cover is a must. The Kindle does feel sturdy overall, but we'd feel better having it in a protective cover. 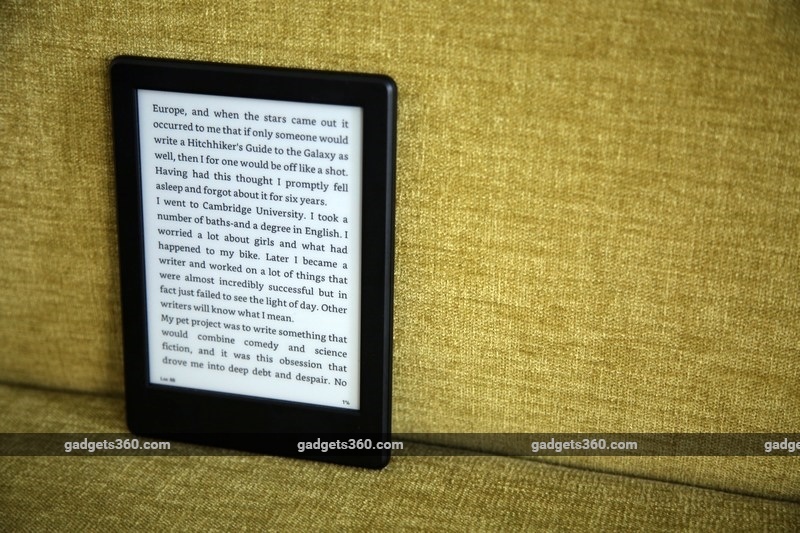 The display on the basic Amazon Kindle is another area where Amazon has made a compromise. It's a low-resolution screen - 167ppi vs 300ppi on every other Kindle. Fortunately this won't bother most people while reading. We were quite impressed with the screen. Fonts are crisp and legible, and you won't notice the low resolution unless you really stare at the text. If you're moving to this from a Paperwhite, the transition will not be easy. But if this is your first Kindle, the screen won't bother you. However, the lack of a front light could be a dealbreaker. If you often read in dark places, you will sorely miss the front light. We felt this the most while reading during train rides to and from our office. Some trains are poorly lit and lights go off for around 15-20 seconds in certain parts of the journey. This is where a Kindle Paperwhite allows you to continue reading. With the Amazon Kindle, there was no choice but to break the flow of reading and wait for better lighting conditions. In poorly lit trains, the reading experience was so bad that we had to stop reading altogether. You could of course buy a clip-on light, but that's not an elegant solution. The battery life of the Amazon Kindle is pretty good. If you use the device in airplane mode, it should easily last over two weeks on a single charge. This is no surprise as long battery life is one of the hallmarks of the Kindle range. We read three novels during the review period and the slightly slower page refresh and longer loading times for various options bothered us. Once again, for those trying a Kindle for the first time, these things won't be that big a deal so we're willing to overlook these shortcomings. In bright light, the reading experience is very good, and that is what matters. Overall we were fairly pleased with what Amazon offers at this price point. At Rs. 5,999 the Amazon Kindle is a solid ebook reader for most people who've never used such a device before. We've seen the price drop to as low as Rs. 4,899 during sales so keep an eye out for discounts if you want to buy this.